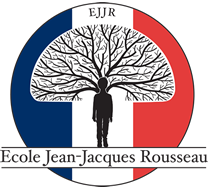 The performing arts program at Jean-Jacques Rousseau includes Theater and Music Appreciation. All instruction at all levels is in French. While Theater is optional, Music is mandatory starting Elementary level. Students are required to perform twice a year. Our performing arts director has created a comprehensive, integrated curriculum for the development of our young students. This aspect of our French education is a limitless resource that will prepare the students not only for the stage, but also for life. Our program embraces all aspects of French art and fortifies the experience with the use of the work of famous French activists, literature, journalism, music and dance. Theatre education provides a foundation for the development of unity, self-confidence, temerity, and self-discipline with strong French communication skills. It helps students to learn more about themselves and the world by helping them to build an awareness of the diverse situations, life circumstances, and perspectives. Our performing arts program aims to provide students with the opportunity to experience the full range of emotions and human experiences in a healthy and non-judgmental environment.